Welcome to the new Legion of Blood discussion thread! Following on from the release of the second edition Age of Sigmar rules, this thread is the main thread to talk about all things related the Legion of Blood allegiance of Grand Alliance Death. For new players Legion of Blood is ruled by Neferata, rumoured to be the first Vampire from the World that Was. We do encourage people to create your own threads talking about your armies, home written fan fiction, conversions and paint jobs (not everybody frequents the painting forum), but this thread will be the central place to talk tactics, list building and general conversation and similar. You all know the drill! Right I will kick it off. I love blood knights and zombie dragons so legion of blood is a no brainier for me. The decrease of blood knights by 20 points in the new edition is ok but they are probably still over costed. However, but I get a lot of mileage out of them as I find they are usually under estimated by my opponents and with 4 attacks a model they murder face on the charge. Here is the current iteration of my list. 50 points spare lets me save a command point to re-roll a vital charge on one of the zombie dragons. I used to run less core and a squad of morghasts but found myself losing on objectives particularly when people came in from board edges and stole points off 5 lonely dogs. Love to hear your thoughts and experiences and how I can improve my list. With the rumors that the Mournghul might be LoN kosher, I'm wondering if Neferata + a Mournghul could be an interesting bravery bomb list. The -2 to hit is backbreaking against almost any army and you can pick up some Terrorgiests to really abuse it. 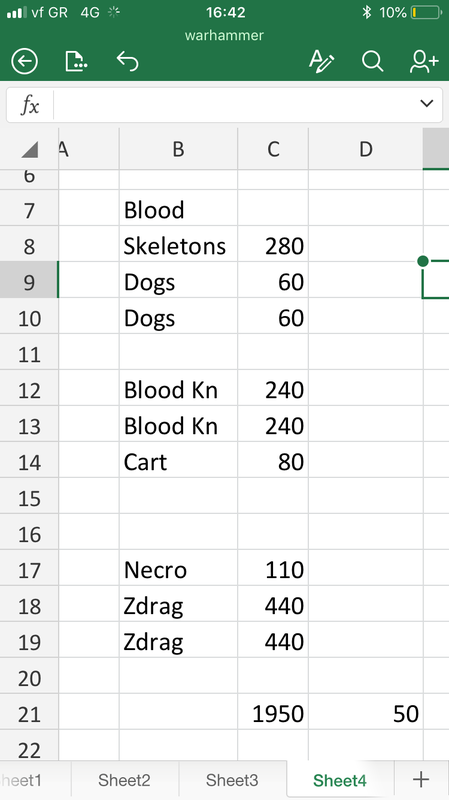 I'm not sure how a list would look like, other than shoving in some skeletons and Morghasts for the banner effects. It'd really hinge on projecting the -2 to hit in the right spots as much as possible. Perhaps Nighthaunt with an allied Neferata would be better? But I start blabbering XD In essence such a List would be fast, very fast with Mournghoul and stuff, so you want someone with a banner that can actually keep up speed wise. Blood Knights with the Point Reduction might be a really nice choice for that, since they still hit well. imo swap out something so you can run some black knights for fast moving additional -1 bravery debuff aura. It also might be worth grabbing the gnashing jaws spell for more bravery debuffing. So I've been toying with going legion of blood, it seems like terrorgheists and banshees should synergise well with the bravery debuffs but since the other allegiance ability only applies to non-summonable units, the Legion seems a bit disjointed to me as a result. From looking at those example lists above, it seems like everyone leans hard into vlozd and blood knights, with a summonable backline. Do you feel it works well? Howabout in 2nd edition, when your summonable units can suddenly keep coming back 3-4 times? Does that make blood knights and vlozd seem less valuable? Lastly I was surprised nobody has mentioned emerald lifeswarms yet. Having a vampire lord with your blood knights to put that beside them seems to have serious potential - regenerating super-knights to match the rest of your army! I feel like the dilemma is that if you want to run a bunch of summonables then you are just better off running other legions. I agree, though, there is room for terrorgheists to do work in LoB, esp comboed with banner debuffs, overwhelming dread, and gnashing jaws. Personally, I plan to run some summonables in my LoB army though. I feel like Black Knights are sleeper OP for LoB since they can bring the -1 bravery banner aura up the field really fast. Banshees, however, feel too slow too me for LoB, their scream just doesn't have enough range for an army that wants to be fast. For 20 points more than Terrorgheist + Banshee you could maybe ally in the Ghoul King version? Adds a Wizard, provides itself recurring heals, and for a CP you can summon in 3 Flayers that can each make their own scream attack on the turn they were summoned. Granted its a weaker scream than the Banshee, but under the right conditions it might do some work, and the Flayers can actually get in there and mix it up too. I feel like the dilemma is that if you want to run a bunch of summonables then you are just better off running other legions. Personally, I plan to run some summonables in my LoB army though. This is my problem - thematically blood seems right, but doesn't synergise as well with all the summoning legions of nagash get. I feel like leaning too heavily on blood knights and vlozd just robs you of a lot of tactical flexibility as well. What summonables would you use then? And has anyone thought about getting dire wolves for battleline, then just alternating black knights and terrorgheists for the rest of your army? ? That sounds really good actually, I always felt like flesh eater courts could go well alongside this army and now I see why! It'll be a while before I get those minis though, have you tried it? That is a great idea, I could even see it working on other Legions to be honest. Free points from summoning are nothing to laugh at. Black Knights, Spirit Hosts, Dire Wolves, and/or Skeletons. Those are the ones I'd choose as well - I'm guessing fell bats just don't cut it for most people? I haven't tried it, but want to try it out once 2.0 drops to see if it has any legs. I could even see it working on other Legions to be honest. Free points from summoning are nothing to laugh at. Yeah, I was originally thinking of it in terms of ambushing in Night, and am now noodling it as a possible for GHoN. Not unless they get a big pts reduction in GH2018. They are really inefficient for their cost atm. Bravery 10 armies just seem like too much of a soft counter. I think there will be a lot of Nighthaunt and Maggotkin running around. What tactical flexibility do you feel other units bring? What are the holes that need plugging in the Blood Knight build? So, from what I can see from a cursory glance, blood knights are very elite and highly concentrated force. If you get the charge in they do great, but can get bogged down quite easily. Compared to other legions/builds, you'd lack healing, respawn, and board coverage/control. I therefore find myself thinking that point for point, you're better off with 10 black knights (maybe even in 2 units) than 5 blood knights. Blood Knights seem to be a pretty good cavalry list buried in the Death lists. But each seem to be doing a different thing. I'm not sure if a good cav build is better than a good Death build. The black knights (BkK) are doing a bit of a different thing in those Death lists than the Blood Knights (BdK) are. I see Death lists sort of falling into answering the question of to Nagash or Not to Nagash. Those that run Nagash are definitely playing a game that that the Blood Knights just aren't suited for. Those that don't run him seem to be playing a hyper attrition game. Again, the BdKdon't play that game. This brings us to Legion of Blood. One of the allegiance buffs is specifically for the BdK so it's hard to not consider them under this allegiance. And you want a few of them, to leverage the ability. Throw in some wolves to screen and a VLoZD and you've got a Cav build. I see these lists as attempting to grab objectives early and camp them while pinning the opponent into their DZ. In this context they seem like many other cav lists. The Wolves screen against alpha strikes allowing the BdKs to go where they will do the most damage and engage where the BdK would get bogged down. Respawning is icing on the cake after they've done their job. I'm not sure the Black Knights do as good a job here as the Blood Knights. But the options are fairly limited which worries me. It's just fewer tools in the tool box. They don't kick out mortal wounds really and can struggle at putting out blocks of damage to take down really big stuff. I'm looking at running a full unit of wolves along with my Blood Knights. Looks good as a Blood list to me. I like it. Combine 2 min BoK into 1 x 10 man unit to get more mileage out of a CP buff. Change the max Wolves unit to 10 Hexwraiths (!?). Idea here is to use the Hexwraiths as a screen for your big BoK group, then on your turn fly over the enemy to open them up to the charge. Can't charge through wolf screens. That is really nicely put, thanks for the summary! I've been thinking of them as legions of nagash but really they're more like an old blood dragons army hidden away in the book, possibly even moreso than Soulblight. This is however making me lean away from them a little (at least for the moment) as I just really want a big load of respawning skellies and such. I've got 5 blood knights - well, dragon princes - waiting to be stripped and repainted and will use them (and legion of blood) for path to glory, but after that will give night and grand host a try. Hurling disposable black knights at the foe, then bringing them back, has a lot of appeal to me. I just really like the idea of chucking 60 wounds 16" forward with that extra command point. All these elite knights need some bodies to balance them out I think. Combining a couple Blood Knight units has merit though. I'm still getting the models together. Played a few 1K games though. I just really like the idea of chucking 60 wounds 16" forward with that extra command point. How are we moving 16" with a command point? Guaranteed 6" run. (10" move). Dire Wolves move 10" + 6" run = 16"
That should put them on any midfield objectives easily. 30 Wolves × 2 wounds = 60 wounds. That's with the 6+ FNP if I get a Vamp Lord up there w the Pinions spell.